Some people accuse leftist federal government (namely Obama) of picking winners and losers. That isn’t really fair. Obama just picks losers. Solar-cell manufacturer Solyndra became a household name when it collapsed, taking $627 million in American taxpayer dollars with it. It’s the poster company for the government picking winners and losers—or really, just losers—in the energy market. But there are 12 more “green energy” losers that have declared bankruptcy despite attempts to prop them up with taxpayer money—and the list is growing. There’s a reason why these companies could not rely solely on private financing and needed help from the government. They couldn’t make it on their own; they couldn’t even make it with extra taxpayer help. These green government “investments” take from one (by taxing or borrowing) and give to another, but they merely move money around. They do not create jobs. They send labor and resources to areas of the economy where they are wasted. Proponents of special financing and tax credits for solar companies claim that these benefits will pay for themselves down the line—but when the companies receiving them are going bankrupt, that is highly unlikely. Kate Adams, a member of Heritage’s Young Leaders Program, and Heritage’s Rachael Slobodien compiled a list of the 12 members of the Green Graveyard—companies that received taxpayer money for green initiatives yet have filed for bankruptcy. Abound Solar (Loveland, Colorado), manufacturer of thin film photovoltaic modules. Beacon Power (Tyngsborough, Massachusetts), designed and developed advanced products and services to support stable, reliable and efficient electricity grid operation. Ener1 (Indianapolis, Indiana), built compact lithium-ion-powered battery solutions for hybrid and electric cars. Energy Conversion Devices (Rochester Hills, Michigan/Auburn Hills, Michigan), manufacturer of flexible thin film photovoltaic (PV) technology and a producer of batteries and other renewable energy-related products. Evergreen Solar, Inc. (Marlborough, Massachusetts), manufactured and installed solar panels. Mountain Plaza, Inc. (Dandridge, Tennessee), designed and implemented “truck-stop electrification” technology. Olsen’s Crop Service and Olsens Mills Acquisition Co. (Berlin, Wisconsin), a private company producing ethanol. Range Fuels (Soperton, Georgia), tried to develop a technology that converted biomass into ethanol without the use of enzymes. Raser Technologies (Provo, Utah), geothermal power plants and technology licensing. Solyndra (Fremont, California), manufacturer of cylindrical panels of thin-film solar cells. Spectrawatt (Hopewell, New York), solar cell manufacturer. Thompson River Power LLC (Wayzata, Minnesota), designed and developed advanced products and services to support stable, reliable and efficient electricity grid operation. Is there a company somewhere that you don’t like? See if you can get the Obama stimulus spenders to give money to it. It’s the kiss of death. American Catholicism’s pact with the Devil? In this article at ToRenewAmerica, I wrote about the failure of the “Seamless Garment” perspective of Cardinal Bernadin to provide a proper moral compass for Catholics and other Christians by equating the moral necessity to resist abortion with the promotion of essentially socialist perspectives on society and government, making resistance to abortion the hostage of socialist policies. Bernadin’s positions on this have provided cover for way too many Catholics to support leftist, pro-abortion politicians, in the name of vague sounding concern for the poor, politicians whose policies and enacted laws have had a distinctly non-vague, and very negative impact on life in these United States. And now the comeuppance of these very confused Christians and Catholics has arrived, in the form of a President Obama whom they helped to elect, a president whose plan all along was to find a way to force all Americans to pay for abortifacient birth control, even if it is against their religious beliefs. Now, Professor Paul Rahe has written on American Catholicism’s Pact With The Devil. ….the leaders of the American Catholic Church fell prey to a conceit that had long before ensnared a great many mainstream Protestants in the United States – the notion that public provision is somehow akin to charity – and so they fostered state paternalism and undermined what they professed to teach: that charity is an individual responsibility and that it is appropriate that the laity join together under the leadership of the Church to alleviate the suffering of the poor. In its place, they helped establish the Machiavellian principle that underpins modern liberalism – the notion that it is our Christian duty to confiscate other people’s money and redistribute it.At every turn in American politics since that time, you will find the hierarchy assisting the Democratic Party and promoting the growth of the administrative entitlements state. At no point have its members evidenced any concern for sustaining limited government and protecting the rights of individuals. It did not cross the minds of these prelates that the liberty of conscience which they had grown to cherish is part of a larger package – that the paternalistic state, which recognizes no legitimate limits on its power and scope, that they had embraced would someday turn on the Church and seek to dictate whom it chose to teach its doctrines and how, more generally, it would conduct its affairs. In my lifetime, to my increasing regret, the Roman Catholic Church in the United States has lost much of its moral authority. It has done so largely because it has subordinated its teaching of Catholic moral doctrine to its ambitions regarding an expansion of the administrative entitlements state. In 1973, when the Supreme Court made its decision in Roe v. Wade, had the bishops, priests, and nuns screamed bloody murder and declared war, as they have recently done, the decision would have been reversed. Instead, under the leadership of Joseph Bernardin, the Cardinal-Archbishop of Chicago, they asserted that the social teaching of the Church was a “seamless garment,” and they treated abortion as one concern among many. There is more at the link, all worth reading, and pretty forthright in its condemnation of the Catholic church leadership’s “deal with the devil,” that is, its deal with the powers of the state. Basically, it failed to render unto God what is God’s, and gave way too much away to Caesar, and was aided in this by liberal Christians of all stripes. In the beginning post of this series, I told the story of how California doctors and medical providers just couldn’t get it through their heads that even though I was a 35 yr old soon-to-be-mom, I did NOT want amniocentesis, because of the risk of miscarriage and the fact that it could not reveal any information I would actually be able to use. But the medical types were really determined. In the second post of this series, I told of how a doctor threatened to withhold care from me, and a necessary examination, if I didn’t submit to his attempt to coerce me into “genetic counseling,” at a minimum, with the obvious agenda of getting me to agree to amniocentesis. How DARE the doctors make me defend my refusal to have a test that could have resulted in my child’s death! Imagine the news if “just” one percent of school buses on a given day crashed. Out of ten thousand school buses, that means that one hundred buses crashed. Now, imagine the public’s reaction if every child on those hundred buses died. It’s incomprehensible to imagine such a thing. When a SINGLE bus crashes and ANY children are killed, the tragedy makes national news. Yet the medical establishment displays a remarkably cavalier attitude toward the fact that given the prevalence of amniocentesis, undoubtedly many healthy, “wanted” children die every year or are born prematurely. I have since come to understand another disturbing fact surrounding the aggressive push for prenatal testing: many parents demand these tests. We live in an age where, as Mark Steyn has stated, parents often put off childbearing until later in life and then have “one designer baby.” And only one. As fertility invariably decreases with age, some turn to fertility drugs and/or in vitro fertilization, which can result in multiple fetuses. No worries, though. Through a process known as “selective reduction,” the mother can have the “extra” babies killed, leaving her with only one child. And boy, that kid better be perfect. If the child fails to meet the consumers’ (aka parents’) expectations, the doctor might well find himself slapped with a “wrongful birth” lawsuit. The heart-breaking fact is that around 90% of children identified with Down syndrome are aborted. (It’s worth noting, however, that amniocentesis is not completely accurate, which means that a number of “healthy” children are mistakenly thought to have a genetic defect and are then aborted.) Given the fact that prenatal life is valued so little, I suppose it’s no wonder I was sometimes treated as a socially irresponsible freak for refusing genetic testing. My next several visits to the obstetrician were uneventful, except that he kept looking at my chart and saying, “Oh, yeah. You refused amnio.” Was my choice really that unusual? Perhaps so. During that time, I ran into several women, mostly strangers, pregnant women who would say, “I had to have amniocentesis.” One even said to me (both of us standing there, pregnant, in Burlington Coat Factory’s baby section), “I’m scheduled for amniocentesis tomorrow. I really don’t want to do it, but I have to.” How many women are made to feel that they have no choice? About nine weeks shy of my due date, I began having painful contractions. It didn’t appear to be labor, but with my doctor’s recommendation, I decided to take a break from my job as a special education teacher at a local junior high. A short time later, I went into full-blown preterm labor. My baby wasn’t handling my contractions very well, so the doctor said they were probably going to have to deliver her early. Thankfully, labor was stopped by a combination of three different medications. I was confined mostly to bed for the remainder of my pregnancy and continued taking medication. Given this precarious situation, I couldn’t help but wonder if an earlier decision to have amniocentesis might have resulted in an extremely premature baby – or even a stillbirth. I’ll never know, but I shudder when I consider the possibilities. Sometimes you’ve just got to laugh. The previous post in this three part series is here. In the beginning post of this series, I told the story of how California doctors and medical providers just couldn’t get it through their heads that even though I was a 35 yr old soon-to-be-mom, I did NOT want amniocentesis, because of the risk of miscarriage and the fact that it could not reveal any information I would actually be able to use. But the medical types were really determined. Read on. My husband (aka Harmonicminer) and I arrived at the clinic for my L4 sonogram the next day. I tried to put all thoughts of large needles near babies’ heads, prenatal child kil …. er, I mean “pregnancy terminations,” etc., out of my head. I just wanted to see my baby. I was, of course, hoping the exam would bring good news but was prepared to accept whatever the test might reveal. The clinic’s high-risk specialist, Dr. Shah, entered the room, glanced at his notes and said, “You’re here for an L4 and an amniocentesis.” Feeling like a broken record, I explained – AGAIN – that I had thoroughly discussed my options with my obstetrician and had signed the form refusing amniocentesis and genetic counseling. I had only agreed, on my doctor’s advice, to have the L4 sonogram. Dr. Shah snapped, “You should not have been ALLOWED to sign that refusal without first undergoing genetic counseling!” He then said, nonsensically, that amniocentesis was “for my own safety.” Furthermore, he refused to even do the sonogram until, at a minimum, I subjected myself to “counseling.” Seriously?!? Was he actually threatening to withhold medical care unless I submitted to his authority? After signing yet ANOTHER refusal of amniocentesis, I returned to the exam room where the doctor, somewhat begrudgingly, finally did the sonogram. And there she was, my little SOMEBODY… not “potential life,” but undeniably a miniature human being with unfathomable potential. Stretching, moving, kicking, growing, EXISTING. I may have even seen her make a rude gesture to the doctor. Way to go, kid. Part three (the last part of this series) is here. If you’re a lefty, you might be inclined to dismiss this first story, since it’s posted at BIGOVERNMENT.COM, and so biased to the right (although lefties continue to trust the New York Times and the LA Times… funny, that). But the second story, below, is based on a Standford University study…. and we all know what a hotbed of ultra-rightwing radicalism is found at Stanford. I hate that the state has done this, because I have some family members who are counting on the state system to work properly. That is, however, what comes of trusting Democrats to run a budget, let alone make financial projections into the next decade. The three largest California public retiree plans (CalPERS, CalSTRS, and UCRS) that administer pensions of approximately 2.6 million State and Local public current and retired employees have been under tremendous scrutiny since last year’s release of the Stanford University Institute for Public Policy report: “Going For Broke”. The study concluded that California retirement plans liability was under-funded by over $500 billion. The report blamed most of the shortfall on the pension plan’s expectation of future annual investment returns of 7.75%; versus a realistic expectation of a 4.14% annual return. The cabal of California politicians, bureaucrats, and crony consultants that justified granting lucrative benefits to employees while failing to contribute enough to support the true pension costs; solemnly dismissed the Stanford report as unsophisticated reflections by academics. But now that a swarm of local governments want to abandon the floundering retirement trusts; the State plans are only willing to credit a 3.8% expected return. If the California State pension plans adopted the same 3.8% rate they are only willing to credit when participants want to leave; their published $288 billion in pension shortfall would metastasize into an $884 billion California State insolvency. It doesn’t take a Stanford MBA to realize producing consistently high investment returns since 2007 has been a difficult in the extreme. The California State pension plans that currently control $432 billion in assets, suffered a $109.7 billion in losses during the 2008 to 2009 recession. Pension plans normally require employers and their employees to mutually increase contributions to make up pension shortfalls. But public pension plans are notorious for not requiring employees to make significant contribution. California police, prison guards, firemen, and lifeguards can retire at age 50, but have never been required to contribute to fund pensions. With headlines that California plans are in big trouble; many government agencies applied to withdrawal from the State plans. But as calculated below; compounding investments at 7.75% grows to more than three times the amount of compounding investments at a 3.8% rate of return. When I was elected as Orange County, California Treasurer in 2006, I was flabbergasted to discover that the County’s $8 billion of retirement investments was covertly leveraged up by $22 billion of derivatives. I quickly learned that many unions see pension benefits as contracted rights; and pension investing as a no risk crap-shoot for extraordinary returns. If the pension investment returns sky-rocket, the unions will bargain for increased benefits. If the pension investment returns crash; the public employees are protected by rock-solid contract law that prevents any reduction in benefits. In 2007, I was fortunate to gain the support of enough OC Pension Trustees to reduce speculative derivative use by 90%. At the time, Trustees for the California public pension plans solemnly dismissed Orange County as unsophisticated. Shortly thereafter the stock market crashed and the State Pension Trustees stopped making comments. Once famous as the Golden State for leading the nation in high tech growth industries that provided excellent wages; California is now tarnished for having the second highest unemployment and worst state credit rating in the nation. Forbes recently quoted a top venture capitalist that compared the California business climate to France: “I try not to hire here, and I certainly would not launch a company here. But the wine is good.” Tripling of the burden for under-funded pension liability to almost $1 trillion will probably ruin the taste of California wine for most taxpayers. New calculations by Stanford graduate students show that California’s three main public employee pension funds are in more dire financial trouble than previously believed. 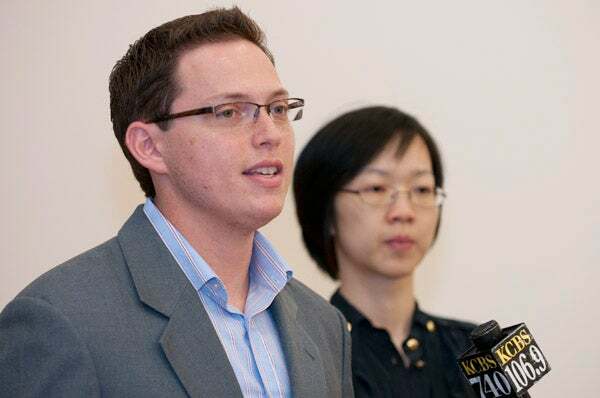 Students Howard Bornstein and Lisha Wang spoke with reporters after a news conference where they and the other members of their research group announced their findings about the state retirement system. California public employee pension systems are worse off than anyone previously projected, according to a new report generated by five graduate students in Stanford’s graduate Public Policy Program. The result could be greater pressure on the state budget and a shortage of pension funds in the future. Bornstein and his fellow graduate students examined public records of past performance of three pension funds – the California Public Employees’ Retirement System (CalPERS), the California State Teachers’ Retirement System (CalSTRS) and the University of California Retirement System (UCRS), which together administer pensions for approximately 2.6 million Californians. The students ran computer simulations to predict the unfunded liabilities of the pension funds over the next 16 years. “The simulation shows that the state would need to invest more than $200 billion, and possibly as much as $350 billion, today to return the fund to a minimum responsible level of funding,” said Bornstein, who noted that the figure is approximately four times the current state budget. “It’s an enormous number,” said Joe Nation, a public policy lecturer at SIEPR and the adviser for the research team. He said it’s important to look at the shortfall relative to state resources. Pension funds fluctuate with market performance, but state employees are guaranteed a fixed pension regardless. If the market performs poorly, the state is obligated to step in and provide the missing pension funds. That takes money away from other public projects, such as education and healthcare, Nation said. “The students did an amazing job providing a better sense of unfunded liability for those three pension funds, and I hope observers out there will begin to understand that this is a financial train wreck that is not very far down the tracks,” Nation said. In the report, Bornstein and his fellow graduate students suggest policies to fix the shortfall and prevent a similar one in the future. They propose that the managers of the pension funds project more realistic rates of return, which would indicate higher liabilities in the future. The students suggest that the minimum level of caution should be for the pension systems to aim for an 80 percent probability of having at least 80 percent of the funds necessary to cover the pensions. They also advocate investing more conservatively, taking fewer risks. The students suggest either reducing pension benefits or moving to a hybrid system in which retirees receive a smaller fixed pension combined with a 401(k)-style plan. This would relieve some of the burden on the state and give employees more responsibility for their retirement. Two-thirds of Californians would support such a plan, according to a poll by the Public Policy Institute of California. But, he said, citizens and institutions are increasingly aware of the situation and are speaking out. “The University of California is engaged in this debate because they finally understand that as pension fund benefits grow, there will be fewer dollars for higher education,” Nation said. The report was prepared for the Office of Gov. Arnold Schwarzenegger as part of the Graduate Practicum in Public Policy, a two-quarter sequence required for master’s degree students in the Public Policy and International Policy Studies programs. In addition to the masters’ program in Public Policy, Bornstein will earn his Masters in Business Administration degree this June. SIEPR conducts research on important economic policy issues facing the United States and other countries. SIEPR’s goal is to inform policymakers and to influence their decisions with long-term policy solutions. What’s funny is the heading above, “major investment needed.” The left wants to make a major investment, alright. An Obama-style investment, called enormous tax hikes to fund impossible promises made to public employee unions. Something will have to give. Higher taxes to fund impossible-to-fulfill promises will just postpone the disaster, and not by very long. A complete, structural, top-to-bottom readjustment is needed, and people have to lose the idea that they can work for 30 years and retire at the age of 55 and still get paid till they die at 95.